If your CPAP trial goes well, you will keep the CPAP machine to use long term. How often should I use CPAP? You should use CPAP every time you sleep. You will need to agree to this to keep the CPAP machine. 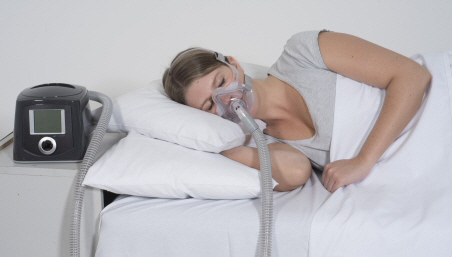 You should take your CPAP machine with you on holiday and if you are admitted to hospital. You should normally be able to do without your CPAP machine for a couple of days without significant risk. But you may start to feel tired due to a disturbed sleep. Do not drive a car or operate heavy machinery if you are sleepy. You will need to look after your machine so that it keeps working properly. There are some tasks you need to do every day, and some every week. Wash the seal of your mask with warm soapy water. Dishwashing detergent is best. Rinse the humidifier chamber each day and replace the water. Make sure you remove the chamber from the machine to do this. Water chamber: Wash the humidifier's water chamber with warm soapy water. Rinse it well and leave it to dry. Most chambers are dishwasher safe. Soak it in a white vinegar solution for one hour to lift mineral deposits. Use one part white vinegar to four parts warm water. Hose: Rinse the hose and leave it to dry. Filter: The filter needs to be kept dust free so that the machine works well. Check it regularly. Avoid using water that is too hot. Also avoid harsh chemicals and sunlight. These can damage the rubber seals and plastic. Keep your mask away from children and pets. Only the Sleep Unit should adjust the CPAP machine's air pressure. If you are on hospital-funded CPAP therapy, you will be eligible for a replacement mask every year. If you need replacement masks more often than this, you may need to pay for them yourself. You can buy masks from USL Medical, Cansleep or Sleep Well Clinic. See below for their contact details. Water is building up in your tube or mask. Reduce your machine's humidity a bit at a time. You're waking with a dry nose or mouth. Increase your machine's humidity a bit at a time, or switch to using a full-face mask. Your machine is blowing cold air. Increase the temperature of your room. Your mask is leaking around its seal. Refit your mask and adjust the straps if you need to. You may need to practise putting the mask on and off in front of the mirror. The hose is making noise. It is most likely that air is escaping. Check that the hose has no holes. Also check it is connected to your machine and mask properly. Check the position of your mask and aim to have as little air leak into your eyes as possible. The pressure is too high to get to sleep. Use the ramp feature on your machine if your machine has this feature. Read the instruction manual if you are unsure. You're snoring even when you sleep with CPAP. Your machine's air pressure may need to be changed. If you have been discharged from the Sleep Unit, contact USL Medical. If you haven't been discharged, contact the Sleep Unit. Check the power switch and the machine's power cord. Make sure the filter is clean. This is where you will find all the information you need about sleep apnoea and CPAP equipment. A member support site for people with OSA. The site is provided by ResMed, a manufacturer of products for treating OSA. This is where you will find help with your Fisher & Paykel equipment. This is where you will find help with your ResMed equipment. Written by Sleep Unit, Canterbury DHB. Adapted by HealthInfo clinical advisers. Endorsed by clinical director, Sleep Unit, Canterbury DHB. Last reviewed September 2017. Sleep Health Foundation. Retrieved May 2016.